An orangery can create a stylish, bespoke new space to your home and you don’t have to own a stately mansion to have one! Orangeries are a great alternative to a regular conservatory and here at iGlaze we can sit down with you and discuss all your options and what would suit your needs the best. 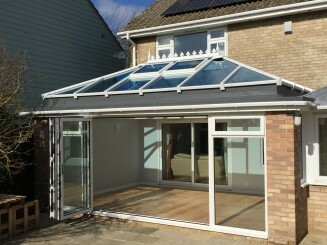 The main difference between a conservatory and orangery is the roof. 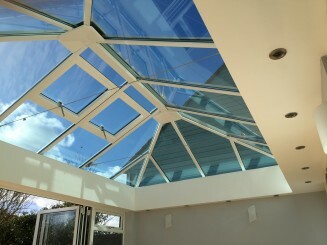 Orangeries have a flat roof around the perimeter with a glass roof lantern that sits on a raised platform built into the roof structure. The finished surface is made of glass reinforced plastic (GRP) which is the same material used on boat hulls to keep them strong, flexible and water tight. All our GRP orangery roofs come with a 25 year guarantee so you can feel confident that your new addition will grow with you family and lifestyle and keep providing space and style to your home. Orangeries make a great addition to your home, are a real talking point and can increase their value by adding an impressive design feature and much sought after space. If you would like to learn more about Orangeries or talk to our team about your options, then please get in touch.